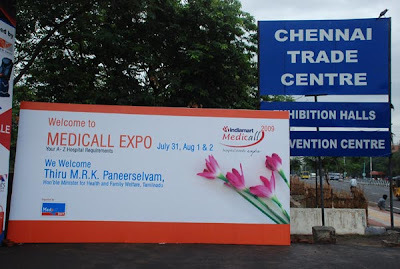 Medicall 2009, India's largest medical equipment expo was launched at Chennai at Chennai Trade Centre on 31st July 2009. In this three day expo, more than 250 National and International exhibitors are displaying their latest equipments. In addition, they also conduct Seminar on hospital management and patient safety issues. Recently, Tamil Nadu Government has announced a medical insurance scheme to benefit 1 crore poor families. This scheme would enable the poor people to avail the medical facilities free of cost in private hospitals also. 300 private hospitals are already approved by the Government to provide facilities. This has exerted pressure on the private hospitals to increase their facilities. This expo comes at this time, when privte hospitals are in look out for competitive world class products. Please watch the feature on Medicall 2009, by clicking 'play' button in the flash player (8 minutes). The video streaming will be smooth in broad band connections. If the streaming is not smooth, you may right click this link and download the video in wmv format to your desktop and play ( 4 mb).